An Ancient Solar System...: What colors are other worlds? ...but Saturn is yellow, Uranus and Neptune are blue, and that's it, right? Well of course not, or that'd be the end of this article. The thing about other worlds is that they are, well, worlds. There's a lot of room on each for lots of different colours. Lets take a look at the Moon, our nearest neighbour: Since it's so conveniently close you may actually be able to stick your head out the window and do this, and it probably looks a silvery white colour. 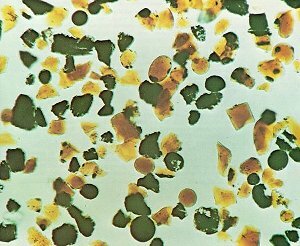 Turquoise particles of lunar soil, courtesy fo JPL. Green and yellow lunar soil, courtesy of JP..
Red and plum coloured soil particles, courtesy of JPL. 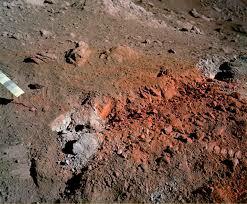 Above: Orange lunar soil, near 'Shorty' crater. Courtesy of JPL/ NASA. These are all coloured beads of volcanic glass, spat out by lunar volcanoes. The different colours are caused by differing chemical impurities. 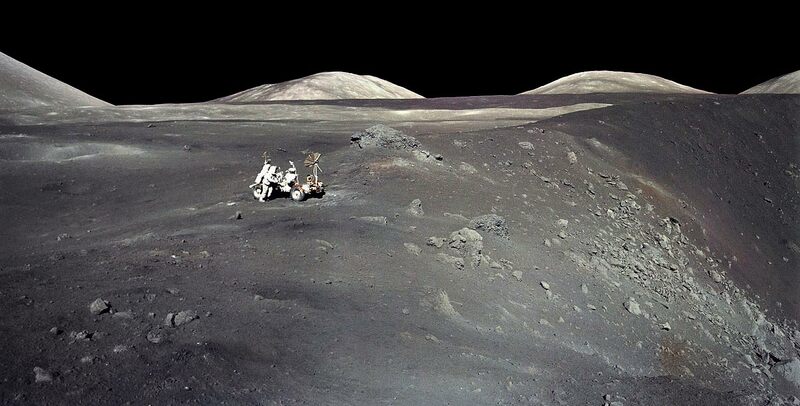 Patches of oddly coloured soil can be found all across the Moon, where one impurity or another has come to dominate for some reason. So, the colour of the Moon depends on how closely, and where, you look at it. How about Mars? It's red, right? Above: The view from Opportunity rover. Courtesy of JPL/ Cumbrian sky. 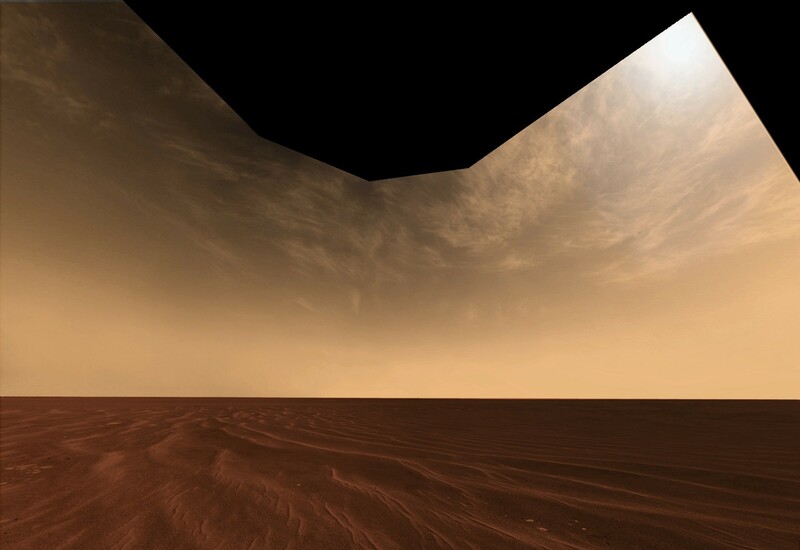 A Martian sunset, captured by the Curiosity rover. Courtesy of JPL. 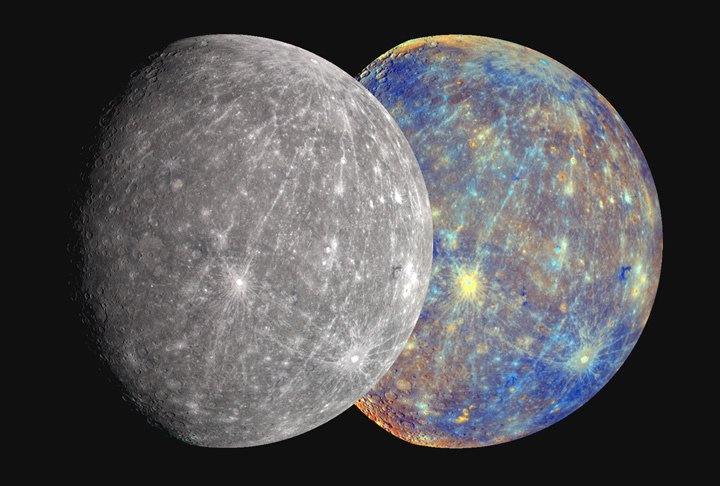 Above: Mercury with the colour vaiations exaggerated enough to see. So the Moon isn't white and the sky on Mars is blue, (or tan, or white, and it could all be wrong anyway if the camera's haven't been set up right). We could keep going all day with examples of how colour is a complicated question on other worlds: There's 'enhanced colour' where a computer program brings out colour differences too subtle for the human eye to detect. Then there're colours beyond the range of a human eye, like infrared and ultraviolet, which are very important on worlds like Titan: There the sky is opaque orange in visible light, but clear in the infrared - so when you see maps like these, taken from space, of Titan's methane/ethane lakes you're actually looking at infra red colours no normal eye can see. Above: Titan's lakes, easily visible in these infra-red colours, but obscured by orage smog in visible light. Courtesy of JPL/ NASA. * I'm not saying they aren't hiding the truth about Mars, just that if they got the colour wrong it's more likely they just ballsed up the color balance. ** The process that makes Earth's sk blue, Rayleigh scattering, also works on Mars. But the yellow/pink colur of alll the dust in the air overpowers it on all bu the calmest days.